The Hagley Digital Archives provides online access to selected items from the Hagley Library's collection of images, documents, and publications related to the history of business, technology, and society. This #WeaThursday is shaping up to be a beautiful day for strolling the scenic grounds of the Hagley Museum and Library, but things are a bit more ominous online. 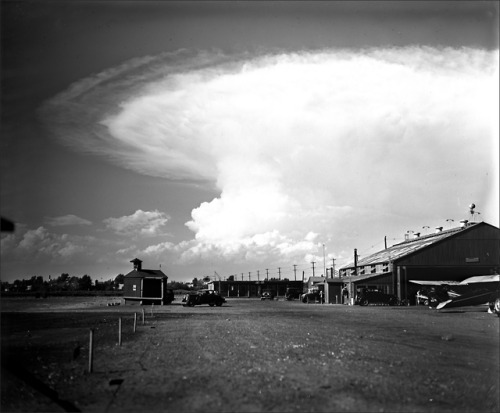 This photograph, taken on September 16th, 1930 shows a thunderstorm gathering over the flying field of the Philadelphia Municipal Airport (or what is now the northern end of today’s Philadelphia International Airport, right along Island Avenue). This image is from the Hagley Library’s J. Victor Dallin Aerial Survey collection (Accession 1970.200). To view more images from this collection, which includes over 7,800 aerial views of towns, cities, and notable landmarks (mostly in the Mid-Atlantic states), visit its page in our Digital Archives by clicking here. Stay informed! Sign up for our e-newsletter and receive info on upcoming events, exhibitions and special offers just for you!